Many ordinary readers of the Bible feel very nervous when interpretation is mentioned. For some, ‘interpretation’ means ‘making the Bible mean what it doesn’t say.’ For others, it becomes the realm of experts who are schooled in complex issues of language and philosophy and threatens to remove the possibility of reading for themselves. They are offered the priesthood of the commentator, who tells them from expert knowledge what the ‘true’ meaning of the text is. 1 Do we need to Interpret the Bible? The material in the booklet has been expanded, reordered and revised from the material in the connected blog posts, with questions for reflection added. Ia m conscious that the issues here are very much starting points—or ‘essentials’ as I style them in the blog posts—but that each of them raises questions for further exploration. On the question of genre (or ‘kind of writing’), the lingering question is always ‘how do we know?’ How do we know what kind of writing a text really is, and what that means for its reception by its first audience? This is an important question not just for the obscure and bizarre parts of the Bible, but for ones that are pretty central. Some years ago, Joachim Jeremias proposed that Jesus’ parables were a kind of storytelling that had only one point, but this observation has since been disputed. And it is instructive to see how the word ‘parable’ is used in the NT; in Mark 3.23, Mark uses the word ‘parable’ for Jesus’ analogy between Satan and the strong man, something we would not normally include within this kind of speech. And yet genre recognition is an inescapable part of reading; it is something we do all the time; and it is regarded by many as the essential starting point for making sense of any text. The moment we raise the issue of historical context, large questions arise about how we know things about history at all, and whether we fit what Scripture says into what we ‘know’ about Scripture, or whether we treat Scripture as a historical source (taken on its own terms) alongside other historical information that we have. This question is acute in relation to the New Testament, which appears to be making historical claims about the life, death and resurrection of Jesus, but it is chronic in relation to the Old Testament, where questions of history are more complex since our non-biblical sources are more scant and contested. Yet we know that ‘a text without a context is a pre-text’, and no text can be removed from its context without losing or changing meaning. Raising questions of the content of biblical texts and their place within the whole canon of Scripture also opens up debate—but it is debate which we cannot avoid if we are faithfully seek to listen to what Scripture says. Although the visual has had an important place in Christian devotion, the Judeo-Christian tradition is distinctly verbal in its constitution. It is through words, and in particular the words of Scripture, that God makes himself known. This is undergirded by the central theological importance of God’s words as powerful, effective and creative throughout the narrative of the Old Testament—God’s creates with speech, calls his people, forms them through spoken commands and calls them to holiness to the words that ‘come to’ his prophets. But it is confirmed by the central theological idea of God’s self-expression in Jesus described as ‘the word made flesh’ in John 1, carried through in the canonical summary of Hebrews 1: ‘God has spoken in many and various ways, but in these last days has spoken to us by his Son’. The Christian traditions that focus particularly on the Bible have sometimes been criticised as turning the flesh back into words again, but that is to ignore the theological connection made between the person of Jesus and the apostolic testimony of the New Testament writings. The testimony of the witnessing apostolic community (see Acts 10.41) is that which leads us into personal encounter with Jesus the living word, and it is the source given to us in which can test, shape and form our personal experience. Human language can never unambiguously convey human meaning; even in conversation with people we know, we often think ‘Now, what did she mean by that?’ This is especially true of writing which, like the Bible, originates in particular times, places and cultures, and these are now at a distance from us. Language functions at a number of different levels. Words have ranges of meanings (often called the ‘semantic range’), but the range of meaning of a word in one language will never exactly match the range of meaning of an equivalent word in another. The English ‘have’ can mean ‘to possess,’ but it can also mean ‘obliged to’ (as in ‘I have to leave now’). The French ‘avoir’ has some overlap with this, but is also used in descriptions of age (‘J’ai trente ans’) which do not carry over into English. It is an act of interpretation to decide which part of the semantic range a word means before we can even translate into another language. Words also carry meaning by making reference within a particular cultural context, and when read in a different cultural context, that meaning needs interpretation. If Jesus is ‘the good shepherd,’ what does that mean in an agrarian (as opposed to a post-industrial) context? And what does it mean in the context of other biblical language about shepherds? Words and language also communicate by means of their impact, which might shock, startle, surprise or reassure, and discerning this impact is another act of interpretation. Finally, words communicate by their very shape and sound, particularly in poetic writing. This is why some translators choose to focus on the meaning of words (in ‘literal’ or word-for-word translations), others focus on more contextual questions (‘dynamic equivalent’ translations) whilst still others focus on impact (paraphrases like Eugene Peterson’s The Message). There is a parallel between the vulnerability of God in coming to us in a particular time and place in the incarnation, and the vulnerability of God in speaking through this particular text with its questions and challenges. The test is always: will we allow God to speak to us, to offer a fresh word, to question and challenge us and lead us into new understanding? These are central issues in the life of every disciple. There are plenty of resources which explores each of these questions further. If you mention your own favourites in the comments below, I will expand this list accordingly. 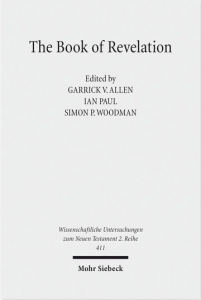 On canon: What’s the Bible All About by Ian Paul and Philip Jenson. The Drama of Scripture by Craig Bartholomew and Michael Goheen. A Walk Through the Bible by Lesslie Newbigin. On context: Exploring the New Testament Volume 1 on the gospels by Steve Walton and David Wenham. Volume 2 on Acts and the Epistles by Stephen Travis, Howard Marshall and Ian Paul. 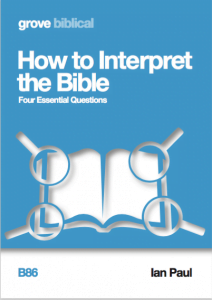 You can buy How to Interpret the Bible: Four Essential Questions from the Grove Books website for £3.95 post free in the UK, or as a PDF e-book. I came across your blog recently and have found it helpful and challenging, not least in your refusal to fudge issues and give fresh insights. This one on Interpreting the Bible is an excellent introduction to the subject and deserves a wide readership. I have one small question and it is why does 3 on meaning come before 4 on content? I think many interpretative and applicatory blunders arise from trying to determine meaning without a close study of content. We met briefly about 17/18 years ago when I was on the staff at Cranmer Hall. Anyway more power to you elbow. Greetings Bob! We did indeed meet—and your contributed early to the Biblical series! The chapter headings are carefully worded: the question in chapter 3 is not ‘What does it mean?’ but ‘What did it mean?’. The chapter explores this more fully under the question ‘What did it mean then?’ That is, it is exploring historical context—which I think is the right thing to do in conjunction with looking carefully at content. In reality, of course, all these things interact with one another, so the order I have presented them makes sense, but not as an absolute rule. Thank you. Clear, concise and thought-provoking, as always. Keep up the good work. This is helpful Ian. I have just one quibble. You counter the common accusation of ‘turning flesh back into words again’ by saying that is to ignore the theological connection made between the person of Jesus and the apostolic testimony of the New Testament writings’. However, the apostolic testimony was not in words only but in ministry such as healing, and in establishing a distinct lifestyle among those they called. So the verbal testimony was given its authenticity and authority by ‘acts of the flesh’ which not only showed the words had real power, but which were themselves part of what attracted people to the new faith. Without this ‘incarnational’ aspect, the apostle’s testimony would just have been empty words to those who had not encountered Jesus in the flesh. Yes, that’s true—but two caveats. First, the apostles appear to see the action and ministry as supporting and endorsing the apostolic message, and in no way supplanting it or making it secondary. Secondly, they never describe such action as ‘incarnational’. The incarnation was about the once-only event of the Word becoming flesh; our action is of quite a different nature. I certainly didn’t mean to suggest the verbal testimony was in any way secondary – in fact I make exactly your first point, that it supported and endorsed the apostolic message. As for using the word ‘incarnational’, it would be obtuse to expect the Bible to use it since it is not a biblical term, but a later theological one. I don’t think our action is of that different a nature, since Paul describes the church as ‘the body of Christ’, and what is that if it is not another form of the Word made flesh? I am glad to hear that—because most people do make this observation to suggest that a focus on the message is somehow ‘Pharisaical’ (even though that was not actually Jesus’ primary criticism of the Pharisees. The reason why our ministry cannot be described as ‘incarnational’ is that Jesus was divine prior to being incarnated; we are not. We have always been human and continue to be so. I suppose there is a case for saying that God’s action through us is incarnational, but in using this phrase most people are focussing on the action of Christians, not the action of God. Like Jesus, Steve has put aside his reputation and sided with the poor and oppressed. Steve is always open to questions – he even makes it clear in most sermons that these are his views and open to debate. In our evening service the format every week is we listen to a sermon, then split into groups and discuss, then put our questions to the speaker. Sorry, Adam, to puncture your hagiography: Steve has played to the cultural grandstand and departed from apostolic teaching. His comments on scripture not being ‘infallible’ are incoherent, contradictory, and quite often insulting. He dismisses criticism but refuses to actually engage in debate. It is really a sorry tale. The reason the poor and oppressed loved Jesus is because he stood up for them against the religious teachers of his day. I appreciate Steve in the same way. Jesus also went against the teaching of his day: Moses had a man killed for gathering firewood on the Sabbath whereas Jesus picked grain and ate it on the Sabbath. Steve has initiated the debate as you can see from the link I posted originally. And you were one of a whole spectrum of people invited to one of the conferences we held on sexuality – I know you met up with Gareth but as far as I remember you declined the invitation. It’s great to invite questions of speakers and have discussion. The main question to ask is: if the NT writers are not trustworthy, then how do we know what Jesus is like so that we have something against which we can measure the trustworthiness or otherwise of the gospel writers who tell us about him? One of the great things about our church is that everyone has differing views on most things but we unite in Christian service: we help run a foodbank, a debt advice centre, a farm, two schools, and all the activities that these bring about. So I can’t speak for anyone else, but for me, being a Christian is not about having the ‘correct’ thoughts it’s more about doing the ‘correct’ thing. Will believing in the virgin birth make you a good Christian – probably not, but feeding the hungry at the foodbank will. Many people have been inspired by Jesus’ teachings – but only by some of them. Most people pick and choose the ones they live by. I’m not sure it’s possible to say whether the NT writers are trustworthy or not – I prefer to have faith in God rather than them. Why do you think the Bible is infallible? That’s great to hear. Thanks so much for commenting. Sorry for the delay in reviewing your book – I’ve now rectified that and posted the review here. So to come to my own biblical interest, Jesus, you ask how we can know about him. Well if you want history I suggest that you can’t know much about him aside from the use of a dogmatic and unprovable insistence that the New Testament is true which not even all the Christian biblical scholars believe anymore. (And, no, I don’t believe Jesus was an evangelical either. How unhistorical!) There are no independent records confirming its story even if you believe all its books are telling the same story (and Christian interpreters love a good bit of harmonization – but only when it suits!). The non-Christian evidence for Jesus is amazingly small and amounts to a few statements. So we are left to agree with the believers – or not. Is this any kind of basis for saying we know things about Jesus? Would we accept as evidence about any other historical character, on sight and without a great deal of skepticism, the testimony of avowed worshippers and swallow it whole? Should we believe the gospels are true, even where they contradict themselves, just because someone sincerely wrote them? Might we not as well believe that Odysseus killed a Cyclops and Heracles a Hydra? To me that just seems like saying “I am invested in this so I’m going to justify it no matter what.” That may convince saps in pews but it seems to me to be rather better characterized as nigh on self-deception because it feels better in its effects than a proper critical approach.